Our special types consist of 10 types of strip brushes with metal backing widths from 1,8 mm to 13,5 mm, which we can produce in a large range of variations.You can choose:- All fill types, e.g. natural bristles and hair, plant fibres, wires and synthetic filaments. - The backing strip material made of galvanized steel, stainless steel (1.4301, 1.4571) or brass.- The trim height (BH) (free bristle length)- The overall length from a few centimeters to the maximum length which can be transported. The strip brush type 60 will mainly be mounted in half-rings with various numbers of grooves around the periphery and therefore used as a roller brush. The ring diameters are 80 mm, 100 mm and 102 mm. 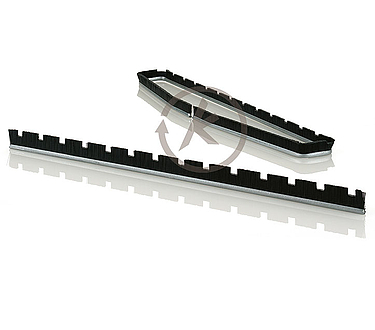 We can supply holders for fixing the strip brush type 25 and type 40.